Councillor Keith Percy introduced the Ceremony: “Ladies and Gentlemen, thank you for coming. The munitions factory at White Lund was opened in June 1916 in the middle of World War 1. Its official title was National Filling Factory 13 and its task was to fill large shells with high explosive. At its peak it had 4,000 workers, nearly two-thirds female. It was highly dangerous work and health and safety regulations were not top priority. The factory covered 250 acres and was made up of about 150 closely packed buildings mainly constructed of wood. The factory worked non-stop shifts, including throughout the night. On October 1917, at about 1030 in the evening, there was an explosion followed by the outbreak of fire. Fortunately, at that time most of the workers were on a meal break in canteens close to the perimeter of the site and most eventually escaped although in considerable panic. Throughout that night there were continual deafening explosions; shells and shrapnel shooting into the air and fires spreading and raging throughout the site. Explosions and fires continued for three days. Some explosions were felt as far away as Burnley and the glow in the sky could be seen from the outskirts of Liverpool. Shrapnel dropped as far away as Quernmore and Scotforth and windows in both Morecambe and Lancaster were blown in. Many terrified people in Morecambe left their homes in their nightclothes and headed towards the seafront. 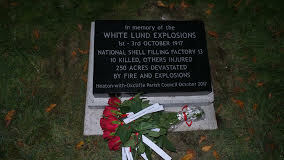 By the fourth day the whole of the White Lund site was devastated and ten men had been killed, mainly fighting the fires. Within 8 months the factory had been partially rebuilt and was in production again. The cause of the explosions was never established, although the most likely cause was worker negligence over smoking. 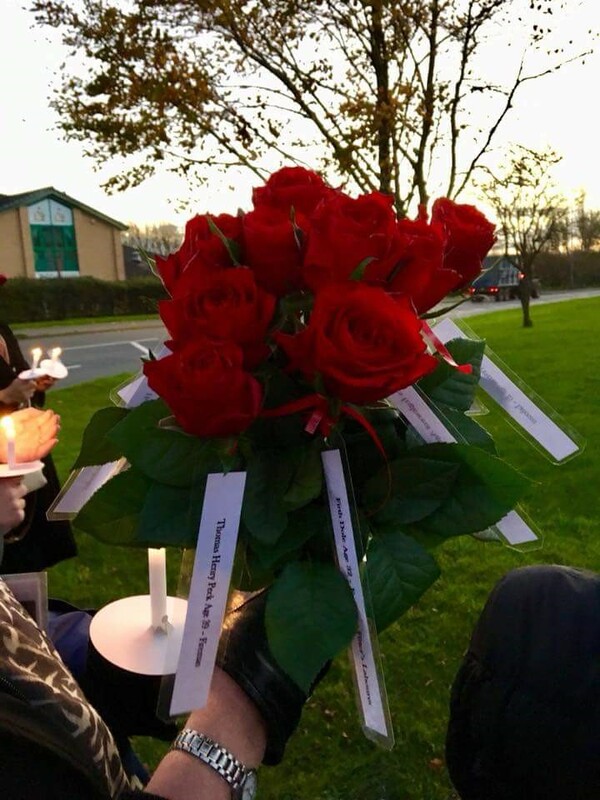 Councillor Jackson then spoke as follows: “It is perhaps hard for us this day and age to picture workers in this area making such an important contribution to the war effort during the First World War. That such dangerous work should be undertaken here by people of such diverse backgrounds, brought together by a national determination to rain down slaughter on our fellow human beings in a foreign land and an equal determination of those in opposition to do the same to us! The workers here were turning yellow from the chemicals necessary to make the explosive heart of the shells to be used in the various battles over the water. Many of the workers, including women who by today’s standards would be considered schoolgirls, were filling shells some of which were taller than they themselves. Then one evening, the War shattered the belief that they were far from the death and destruction of the trenches and made them painfully aware that they too could be touched by what they were creating. We should remember that these people were doing work which they believed was for the greater good – “for God, King and Country”, however hollow it might now seem to many of us. They were sincere in their duty and purpose. Many showed incredible personal bravery when called upon to try to save the factory and the nearby town, our town, Morecambe. There was tragic loss of life, injuries caused and destruction of property. The Clerk of the Heaton-with-Oxcliffe Parish Council, Bob Bailey, then read out the Roll of Honour, the names of ten men who died in the explosions and fires.